For the last couple of years, I’ve been traveling more, and doing photography on those trips. When it’s a 2 week trip and I’m taking a suitcase anyway, throwing my Gitzo GT3530LS in with the rest of my clothes isn’t that big of a deal. This year, however, brings a wrinkle to that plan. Instead of doing 1 big trip, I’ll be doing several shorter trips. In some cases, the trips will be short enough that I can fit the clothes I need in my camera bag instead of taking a checked suitcase. Without that checked suitcase, taking my Gitzo is out and I’m off looking for a smaller tripod. Before I talk about the Benro FTA28CC that I ended up with, I think it’s important to talk a little about how and why I ended up there, or at least what my priorities were. My biggest priority was cost. I’m not adverse to spending money on camera gear that’s going to last me a long time and get used a lot. However, a travel tripod, by design and intent, is light weight and as a consequence less rigid than a full size one. Consequently, I had no intention of making this my daily use tripod and as a result paying Gitzo or Really Right Stuff prices. Travel Angel FTA28CC with Really Right Stuff BH-55 in “ready to use” configuration strapped to F-Stop Gear Ajna backpack. Second on my list is leg material. I’ve used both aluminium and carbon fiber tripods over the years, and in my experience, carbon fiber is vastly superior. Compared to aluminium it’s lighter with equal or better strength and more rigidity. Perhaps more importantly to me, is that its thermal conductivity is lower. That means it’s much easier to handle in the cold or in the heat without either freezing your hands or burning them. Third up is twist locks. I have a couple of reasons for wanting this. First, my previous experience with flip locks is that they’re finicky and something of a maintenance hassle. With twist locks, I never have to worry about adjusting them, and short of them being flat out broken have never had one slip when tightened down. The second reason I wanted twist locks was to maintain a consistent mode of operation with the rest of my camera supports. My Gitzo uses twist locks, as does my Oben monopod. Keeping everything twist means I don’t ever end up fumbling with the locks because they’re different. 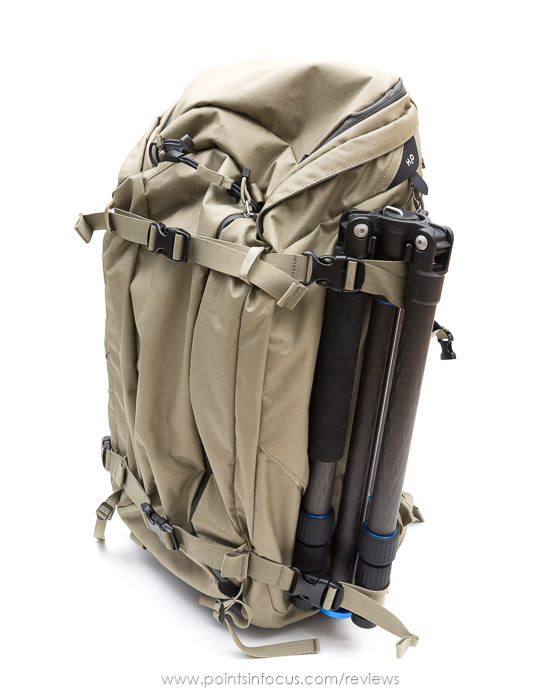 Fully collapsed Travel Angel FTA28CC strapped to side fo F-Stop Gear Ajna backpack. Forth and fifth on the list are the collapse and extended lengths. Normally with a tripod I want a set of legs that extend to be longer than I am tall. The reason being that frequently in landscape and wildlife situations, I’m shooting for uneven terrain and I want the legs to take up the slope while letting me keep the camera at eye level. In this case, the higher priority for me was a shorter overall collapsed length. I wanted something that would collapse as small as possible to make it as portable as possible. As for the extended height, if I could get something tall enough to keep a camera at eye-level I’d definitely prefer that over something that didn’t. Finally, I really wanted just legs only. Most travel tripods come with a head built in, and that brings with it a whole host of other potential issues. Suffice to say, I have heads that I like and know, and I just don’t want to deal with something else (or another head I won’t use). This was certainly less of a concern to me, at least as long as an included head wasn’t permanently attached to the tripod and could be replaced. With all that taken into account, I started digging into the options that were out there. At the time of writing this, B&H lists 36 options for carbon fiber tripods in the 15-20 inch range. Though it probably shouldn’t come as a surprise to me, part of the reason I bought it was the ~35% discount, the FTA28CC is not in the list anymore and is listed as discontinued. Unfortunately, Benro doesn’t currently seem to offer a one-for-one replacement either so far as I can tell either. There are some similar, though perhaps not identical, options sold as “kits” with Benro ball heads such as the C2690TB1. I’ll start this off with the brass tacks, the FTA28CC is a headless, 4-section, tripod with a rapid center column, carbon fiber legs with twist locks, and magnesium castings. The overall weight is 3 pounds (1.36 kg). Fully collapsed, it’s 17.1 inches (434 mm) long. Fully extended it’s 61 inches (1550 mm) tall. Benro rates it as capable of holding 31 pounds (14 kg). Put simply, this meshed very well with my wish/want list above. Fully collapsed the FTA28CC is one of the shorter tripods I found at 17.1 inches without a head. 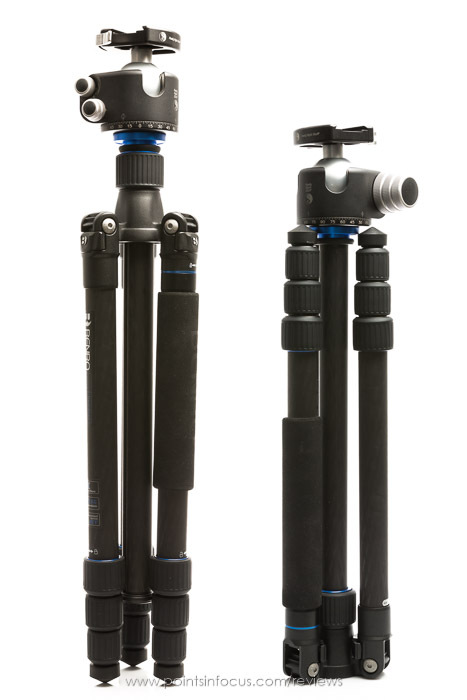 You can certainly find shorter (most of Gitzo’s Travelers are to one degree or another), but you’ll also find a lot of “travel” tripods are 18 or 19 inches ( 457 or 483 mm) collapsed instead. 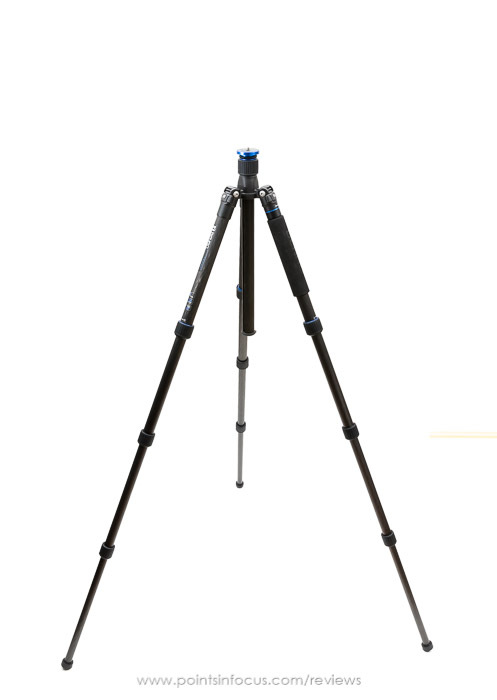 Benro achieves this short fully-collapsed length by allowing the legs to rotate 180°, so they point up, relative to the normal orientation of the tripod. This allows the friction knob for the center column to set between the legs instead of above them, shortening the overall stored length. Comparison image showing the length savings the 180° rotation provides when collapsed. This technique for reducing storage size isn’t unique to Benro or their innovation. 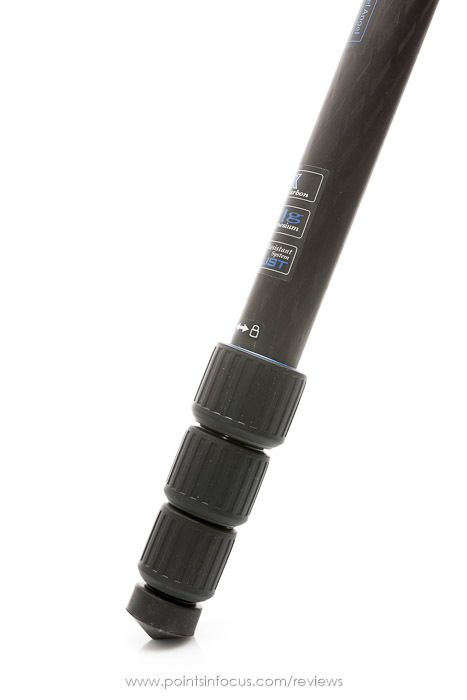 Best I can tell, Gitzo’s Traveler series tripods introduced this style of mechanism back in 2004. That said, while the overall concept is similar, Benro’s execution is subtly different. 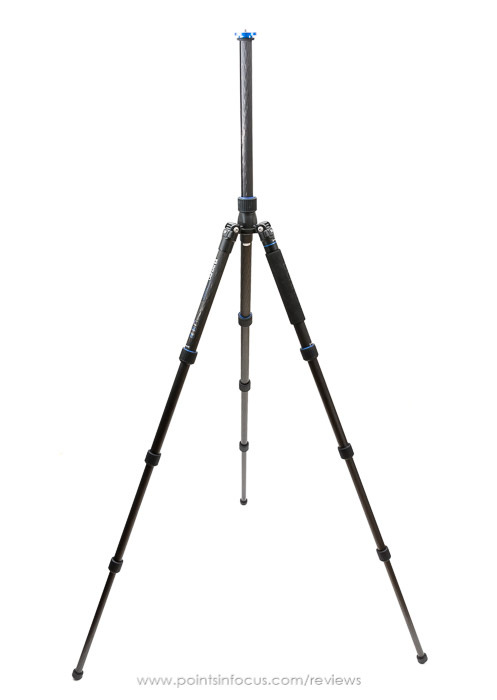 On Gitzo’s Traveler tripods, in the 180° stowed position, the legs extend past the head mounting plate on the top of the center column. Their design allows the legs contain the tripod’s head when folded. This allows Gitzo to produce, for example, a 64 inch (1635 mm) full-extended tripod with head, that collapses to 16.73 inches (425 mm) with a head. Benro’s solution doesn’t allow quite as compact of an overall package, because the legs don’t extend past the head. However, the benefit to their design is that you’re not limited to either using compact heads or not being able to fold up the legs completely. Personally, and in part because I’m using my full size Really Right Stuff BH-55 on this tripod, I like Benro’s approach better than Gitzo’s. Yes , the Gitzo can, in the best case, shave a couple of inches off the length of this Benro, and do that with a ball head attached. However, in my opinion at least, there’s definitely a point where things are compact enough, and making them more compact starts to become a determent not an advantage. On the flip side, at 61 inches (1550 mm) without a head, the Travel Angel FTA28CC stands adequately tall for me to not have to stoop over (I’m approximately 6 feet tall). In practice, 61 inches will just put the top of my BH-55’s clamp at eye level, and the view finder above my head on level ground. Travel Angel FTA28CC fully extended. Travel Angel FTA28CC legs fully extended. Admittedly, to achieve this height, the center column has to be fully extended, and that certainly has implications when it comes to stability and vibration. This is something I’ll be looking at in more detail later on. I can’t find much to complain about with the legs and leg locks on this tripod. The legs can be positioned at 4 angles (including the 180° reversed position). The twist locks are also quite good. The threads on mine are smooth and the locks turn with no unnecessary resistance or grinding. Locking and unlocking takes about a quarter turn on the lock. Finally, the legs do have an anti-rotation mechanism in them so they do not rotate when they’re unlocked or adjusted. That said, there’s one odd inconstancy with the legs on my tripod. When collapsed and rotated into the 180° storage position, the legs are not all the same length relative to the mounting plate. However, when rotated around to the normal positions as you would use the tripod, the tripod is level and the center column is plumb. One oddity on my tripod is that the legs don’t appear to be the same length when stowed in the 180° position, but seem to be equal when deployed. I was concerned enough about this when I noticed it, that I put a level on the center column to check. With the legs either fully collapsed or fully extended, the center column reads level on my tripod even with the odd length difference when folded. In other words, while the legs look a bit funny when in the 180° folded position, they are true enough that there aren’t any actual issues in functionality when using the tripod. 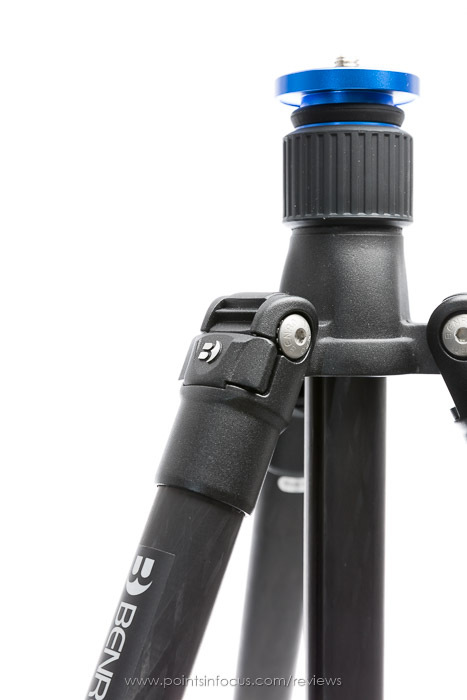 Leg angle and center column locks on the Benro Travel Angel tripod. If there’s one place on this tripod that I am a bit disappointed in, it’s the center column. Though maybe I’m just being a bit unfair here, my point of comparison is a Gitzo after all. My complaint here is that the center column doesn’t really slide smoothly. I haven’t quite figured out what the issue is though. It seems like the hole simply doesn’t align and guide the column well enough to prevent it from tipping and binding. I find that to get the column to adjust smoothly I have to loosen the lock significantly then I think I should. Even then, because I think the column can tip slightly, it will bind sometimes anyway. That said, I’m not sure what could be done to improve things. A closer fitting guide bearing in the bottom of the center casting or something might help. That said, while I might quibble with the smoothness of sliding the column, that’s about the only quibble I have with it. The column is straight, and indexes into the center casting so that it doesn’t rotate. That indexing also means that it will always keep the same alignment between the head and the tripod. Consistent alignment with the tripod is a useful part of my procedure for shooting panoramas using my tripod head angle calculator, and insuring that I can index the tripod quickly and easily. In the normal configuration, there’s a hook threaded into a really big thread on the bottom of the center column. While I don’t normally tether or weigh my tripods down with a camera bag, given the overall lightness of this tripod, doing so is probably a good idea in windy conditions. With the bulk of the features out of the way, it’s time to look at the options, and the Travel Angle comes with a ton of them. Accessories that come with the FTA28CC: 3 spike feed (to replace the 3 rubber ones), a short head mount and write strap for the monopod configuration, a polished wood crutch knob, and a carrying case with shoulder strap (strap not shown). One of the neat parts of this tripod is that it’s more than just a tripod; it’s also a monopod. Well it’s kind of a system on it’s own. One of the legs is padded, and just above the pad is an indication that it can be unscrewed. Unscrewing this leg gives you the foundation for making a monopod. Actually there are three configurations you can set the monopod leg up in. 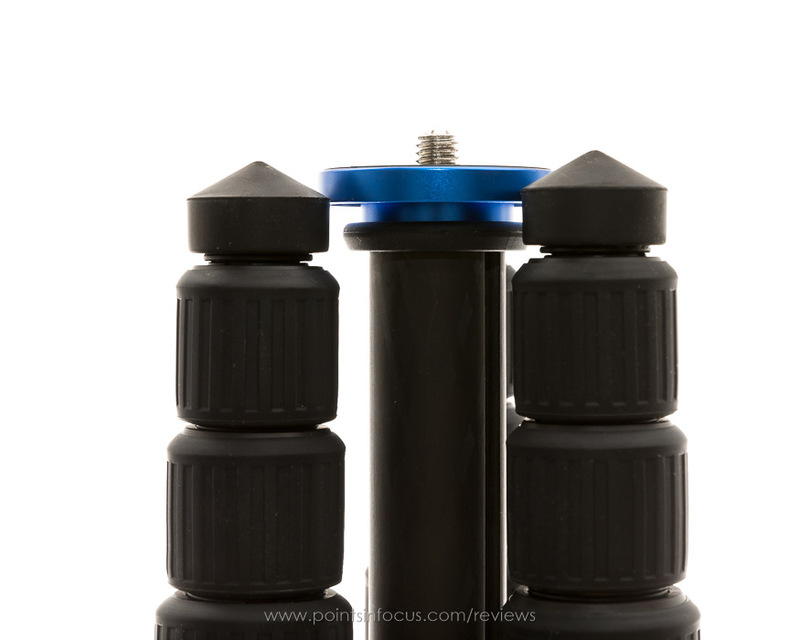 First is a full height ( 64.75″ / 1630 mm) monopod. This is achieved by screwing the long center column into the detached leg. Admittedly, I find this configuration somewhat awkward, due how the center column pushes the leg controls (and the padded grip, which I keep wanting to hold it by) down as far as it does. That said, in a pinch, it’s entirely usable for a monopod. 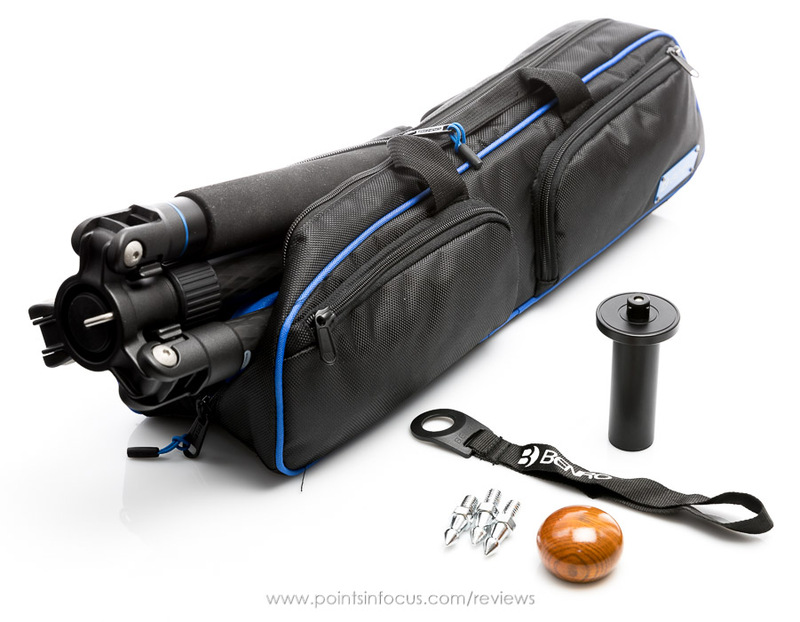 Alternatively, the included shorter top section can be attached to the leg to give a 51″ (1295 mm) long monopod. While this is far too short for me to use standing up, in a lot of cases monopods are used kneeling, and this would be more than adequate for that kind of use (or obviously it would be fine for someone shorter than me). Finally, there’s a polished round wood cap, that Benro describes as being a “crutch cap”. Admittedly, I can’t really see using this as a crutch, I’m not sure I trust a tripod that has a claimed load of 31 lbs (14 kg) to act as a crutch for a person. But I certainly could see using it as a walking stick on a rough trail. Before I jump into the last part of this, an objective look at vibration performance and stability, I do want to make some comments about weight and subjective feel that stems from that. I don’t know if I’d call it a complaint with carbon fiber tripods, but they’re all incredibly light, and almost all feel top heavy to me, especially with a head. My ~2 pound (0.9 kg) BH-55 ball head alone is nearly half the weight of my GT3530, and 2/3rds of the weight of this tripod. Put a 5-6 pounds of full frame DLSR and lens on top of the ball head, and there’s way more weight sitting on top of the tripod than there is in the tripod. That said, while the FTA28CC is more than capable of holding that kind of weight, it doesn’t feel the sturdiest doing it. Well to be clear, it’s not that the tripod feels weak, its that the weight makes it feel like it would be very easy to tip over. While I’m totally comfortable walking away from by Gitzo with the camera sitting on top of it, I’m not so keen on doing that with the Travel Angel. To be honest, this is partly a problem inherent in having a super light tripod. There’s just no mass in the bottom of the legs to make it feel more stable. 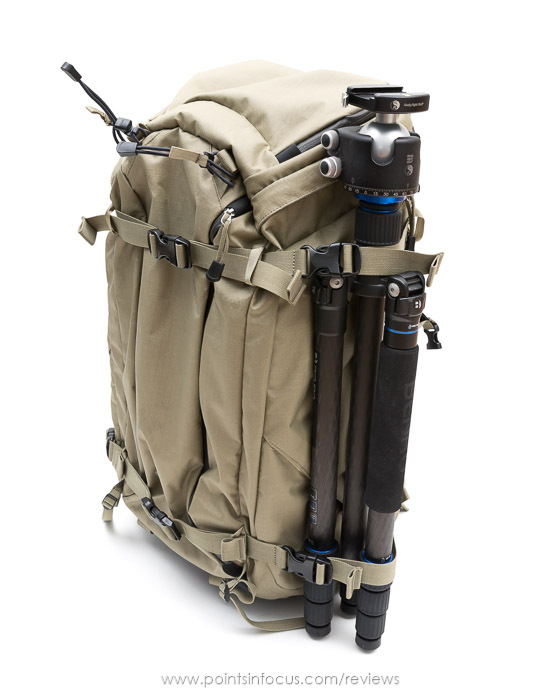 The only real way to counteract this kind of instability, whether it’s perceived or not, is to tie down the tripod to a bag using the hook at the bottom of the center column. Well that or just build up the confidence in the tripod that it won’t go tipping over. Okay, I admit I’m kind of copping out here. I had intended to do some objective performance testing on shake and stiffness here. However, I doing some testing, I’m having trouble coming up with a meaningful test solution that I’m happy with. Initially, I was going to shoot a test target at varying shutter speeds to get a visual gauge as to how the tripod performed with camera shake. The problem with that is to change the shutter speed I need to be able to accurately control the brightness of a light over a 3 or 4 stop range. I don’t have continuous lights that I can do that with. Moreover, I can’t use the aperture or ISO to make the adjustment as that changes the resolution capabilities of the lens and camera. My second thought was to use a pin-hole over a light source to make a pin point light source on an otherwise dark field. That didn’t work either. My final stab at the problem was to use the accelerometer on my camera to record vibration charts. This actually provided data, but I have no way to meaningfully translate a graph of vibration data into something photographic. That is, there’s definitely vibration and there are measurable differences, but I can’t translate that graphed data into something directly related to photography. The short of it, for the moment at least, is that at least for my camera (EOS 5D mark IV) the tripod is stiff enough that I can’t differentiate between changes in aperture and/or ISO from vibrations in the tripod. That said, I do intend to test this in the future when I can devise a test that allows me to reliably isolate the necessary variables. Actually, with the little bit of testing I did do, I suspect that there may be a lot to look when it comes to tripods and mirror slap induced vibrations; especially given advances in mirror design in cameras like Canon’s 5D mark IV and 5Ds. While I wish I had some objective data to go with this review, it’s something that is eluding me at the moment. That said, overall the Benro Travel Angel FTA28CC seems to be a pretty solid tripod. Unfortunately, Benro went and discontinued this specific model basically right as I bought it. That said, all hope is not lost. The C1628TB0 appears to still be made and available, and is, so far as I can tell, identical except it includes a ball head. As an aside on that note, many times the hook is marketed as a place to hang your bag to add weight. If you value the sharpness of your images, you don’t want to do this as the swinging bag will shake the tripod.